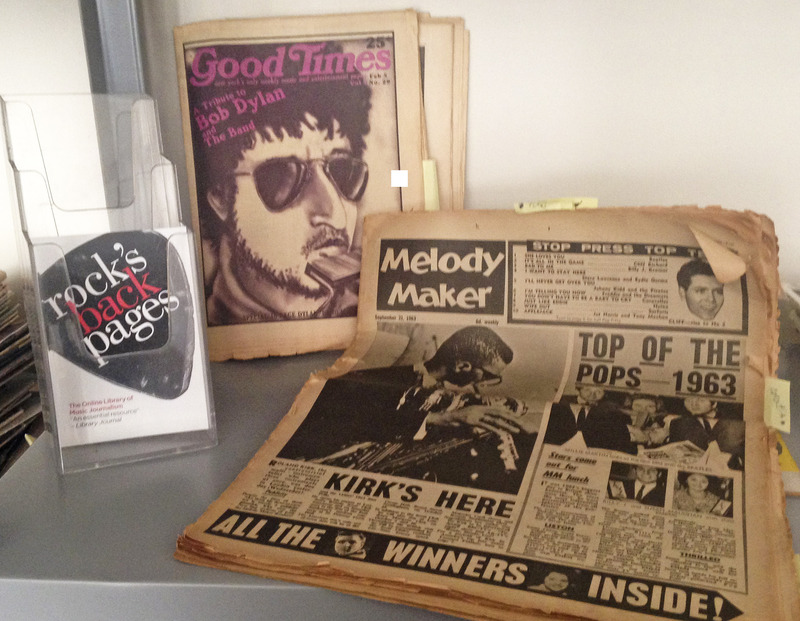 Working from the offices of Rock’s Backpages has many pluses – Mark’s espresso machine, bizarre early 80s New York playlists (Lydia Lunch, brilliant), a fine view of West London – but none outweigh the magazine archive. Everywhere you turn, another gem: a Jim Marshall shot from the Beatles’ last gig at Candlestick Park, Tiger Beat’s Official Monkees Spectacular!, cassette tapes of interviews with Johnny Otis. This shot captures a terrible illustration of Bob, and the days when Roland Kirk was bigger news than the Beatles coming to lunch with the Melody Maker. The Rolling Stones – Exhibitionism has been three years in the planning. Jagger said the exhibition would include some “really silly things … and really I mean silly”. Not all band members were able to contribute as much as others: “I’ve got more Louis Armstrong stuff than I have Rolling Stones,” said drummer Charlie Watts. A brilliant idea. Give away unplayed instruments. See and hear the results down the line. From Ronnie’s website: “Your instrument will be given a tracking number enabling us to inform you of its ultimate destination. Once the amnesty is over, we will prepare the instruments for delivery and send them to Sistema England in the UK and Music Fund based in Brussels. Sistema England, founded by Julian Lloyd Webber, seeks to transform the lives of children, young people and their communities through the power of music making. It is part of an international movement inspired by El Sistema, the Venezuelan programme that benefits children and young people through the creation of grass roots orchestras. Overseas, the collected instruments will be given a second life through Music Fund who distributes to projects in international conflict zones from their base in Brussels. Music Fund is a humanitarian project that supports musicians and music schools in conflict areas and developing countries operating in Africa, the Middle East and Central America.” So there goes my black semi-Fender Strat. « Five Things Extra, Monday 6th July: Attack Of The 50 Foot Jazzman!